The media are a buzz with the amount of money spent from the States exchequer on the one hour stay of the President of India in Belgaum on October 11, 2012. To add to this team AAB had raised this issue then and raising it now again, the tender floated for the Improvements to road of Risaldar Galli, Ganachari Galli & Narvekar Galli Belgaum which was floated on October 5, 2012 has been RECALLED for as no put their bid, but the said road was completed a day before the Presidents visit to the Ram Krishna Mision Ashrama situated at Risaldar galli. 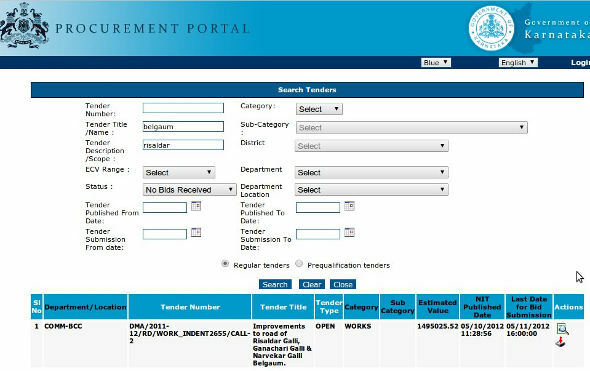 The E procurmement website even today shows that the same tender with Number DMA/2011-12/RD/WORK_INDENT2655/CALL-2 has been recalled. This means the road work was done without the tender being awarded to anyone, Isn’t this a case of not following procedure and also a situation of ambiguity. Sources told us that under the Eproc system until and unless someone bids the same tender will have to recalled and if fort any reason no one bids even after recalling for 7 to 8 times the then the commissioner can seek the government’s approval for 4G exemption for getting work done. The value of the contract is Rs.1495025.52. Sources also informed us that in scenarios like a visit of a president, some works are undertaken without tendering. But to a common man it is a case of simple understanding, “Tender Khula nahi phir bhi Road ban gaya”.